Melbourne Water’s Living Rivers program provides seed funding and partnership to build council capacity in sustainable stormwater management. The 2015 funding round received 50 applications from 23 councils, 22 of whom have been offered $2.9 million in funds for 44 projects. For every dollar of Melbourne Water investment, council and other partners invest $1.15. The good news for councils who missed out on the 2015 funding round is that another round is opening again for applications from local government between Monday 1st February to COB Monday 29 February 2016. The Living Rivers Coordinators are available to discuss project ideas with council staff at any time. 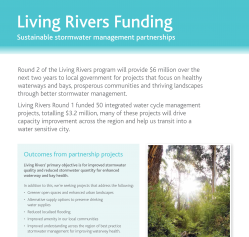 To learn more about funding priorities, eligibility criteria, see case studies of projects previously funded through the Living Rivers Fund, or contact the team visit the Living Rivers web page.